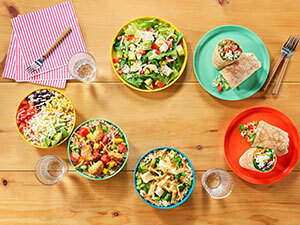 While commercial restaurants such as Domino’s Pizza have been serving USDA-approved menu items for the K-12 segment for years, Freshii went a step further to create a whole menu that fits National School Lunch Program guidelines and allows students to preorder individual meals. Based on Freshii’s previous work with airlines and convenience stores, schools were a natural next step, according to Vice President of Marketing Melissa Gallagher. “It was really important to us that we were able to reach students at some of the most important years of their lives when it comes to developing their body and their minds,” she says. Orders are placed with the local Freshii the night ahead, and the meals are delivered to the school the following day before lunch. The chain is designing an app that will handle the ordering process in the future. Its school lunch menu is made up of several types of wraps, salads and bowls, such as the Kung Fu Bowl, which includes brown rice, carrots, broccoli, edamame, crispy wontons and teriyaki sauce. Students have the option to add chicken, tofu or falafel to any dish. Freshii’s head nutritionist took the lead on creating the menu, making sure that the dishes fit USDA requirements and were popular with parents and students. “We did focus groups with parents and students to not only make sure it aligned on the nutrition side of things, but that it was also tasty for them,” Gallagher says, noting that the current menu is a “good starting point” and will change as time goes on. “We look at our [restaurant] menu at least quarterly and make changes based on demand and feedback from our guests, so this will be no different,” she says. While Freshii is making its first foray into schools, Kiddos Catering, a catering company based in the Chicago area, has been distributing restaurant lunches to schools for more than 10 years. The company, which began in 2007, now serves 20 private and public schools and about five summer camps. A recent new customer of Kiddos is Deerfield Public Schools in Deerfield, Ill., which has gone without an in-house nutrition team for years. Its parent teacher organizations (PTOs) have been responsible for coordinating meals from local restaurants to be delivered to students. That is, until one of its schools, Kipling Elementary, transitioned to Kiddos to help streamline the process. “We were ordering through the restaurants for many years and it was the parents that had to get it all together and it turned into a humongous undertaking,” says Karen Ebroon, co-president of the school’s PTO. Unlike many similar businesses, Kiddos not only picks up the meals, but also serves them. Parents place orders through Kiddos website and can preorder meals about half a year in advance. They can change orders up to a week prior. A different local restaurant is offered each day, and students can choose from an average of six to 10 menu items. Restaurants that partner with Kiddos are required to make their food from scratch daily using fresh ingredients and must be able to handle the volume. Moses will also listen to student feedback when deciding whether to work with a restaurant again.